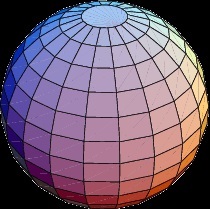 In geometry, a sphere is the set of all points in three-dimensional Euclidean space that are located at the radius from the center. Sphere, In geometry, the set of all points in three-dimensional space lying the same distance (the radius) from a given point (the centre), or the result of rotating a circle about one of its diameters. The components and properties of a sphere are analogous to those of a circle. A diameter is any line segment connecting two points of a sphere and passing through its centre. The circumference is the length of any great circle, the intersection of the sphere with any plane passing through its centre. A meridian is any great circle passing through a point designated a pole. A geodesic, the shortest distance between any two points on a sphere, is an arc of the great circle through the two points. The formula for determining a sphere’s surface area is 4πr2; its volume is determined by (4/3)πr3. The study of spheres is basic to terrestrial geography and is one of the principal areas of Euclidean geometry and elliptic geometry.